Alternative title for this post: "The One Where I Beg an Art Director for Mercy." This is another cozy mystery cover I did for Annie's Publishing's "Mysteries Unraveled" series. 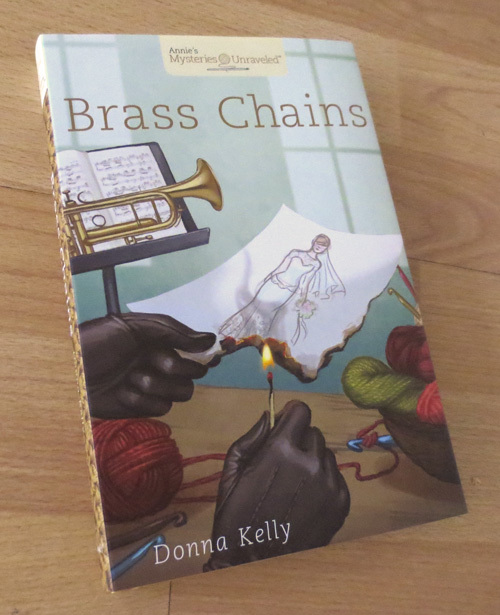 I've posted a few others on this blog, but to refresh your memory, cozy mystery covers tend to have a quaint, small-town setting, a hobby theme (crochet in this case), and a "sinister element" that suggests danger. In the past, sinister elements have included things like skulls, knives, things turned over or torn apart. a police car, lights flashing, reflecting in the bowl of the trumpet. I was worried about that last one, but I decided I would give it a go. I went to Target and bought a toy police car and the shiniest cup I could find. Then I lined up the car next to the cup to see how it would reflect in the cup. I wish I kept these reference photos but I can't find them. I found that the police car only reflected when actually touching the cup, and even then it wasn't very clear. I don't think there's any way an actual police car, outside a window, could visibly reflect in a trumpet inside a room. Sure, I often stretch reality in my illustrations, but I just didn't see how this could work convincingly. I asked the art director if we could maybe possibly sorta please please please go with a different concept. Usually I wouldn't do this, but I really felt this thing wasn't working. By this point I had drawn six other covers for Annie's, so I hoped that the AD knew I wasn't just being lazy. 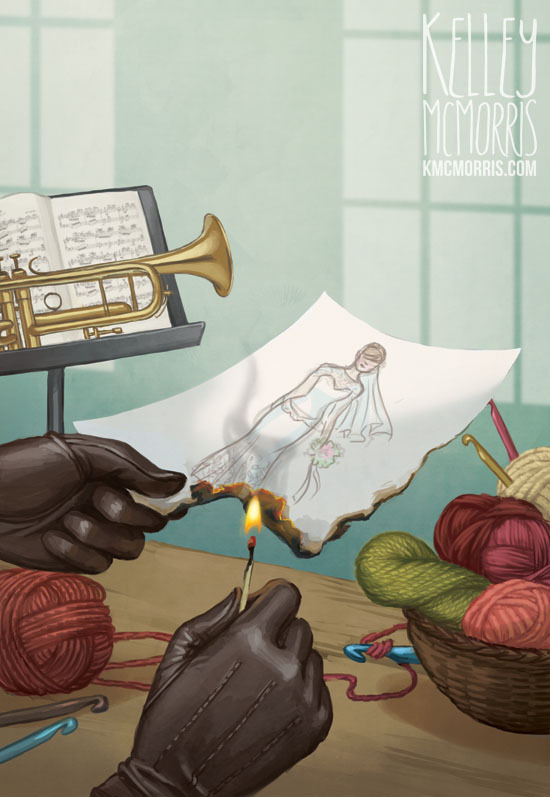 Thankfully the art director was totally cool about it and sent me a new concept: a mysterious person wearing leather gloves, burning the designs for the bridal gown, or the burnt designs sitting on a work desk. Finally I could breathe again, not having such a difficult scene hanging over my head! The AD decided that he liked the second rough the best, so I put together a color rough. 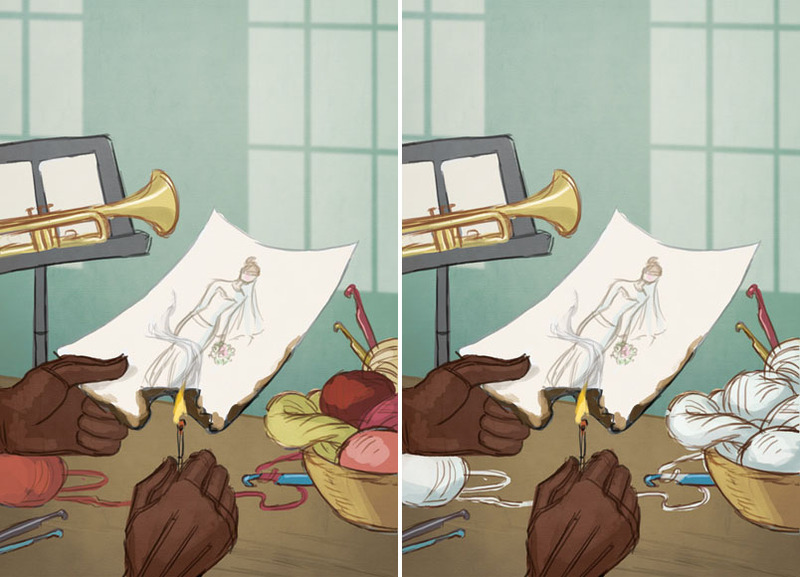 I gave the AD two options - one with colorful yarn, and the other with white yarn, which would suggest that it's the wedding dress which is being crocheted. After some deliberation, the AD decided that he preferred the colorful yarn. I got the green light to go ahead to final! Doesn't the design look great? If you'd like to order a copy, visit Annie's Publishing's website.